This photo was shot a year ago from one of the islands of Visayas – Samar Leyte. We had a day vacation from Leyte because we had an appointment from the government to apply a new passport. We went there early in the morning, we have to travel from Cebu to Tacloban for 45 mins riding with a passenger plane. So we arrived early as expected, our appointment is still at 3PM, we decided to enjoy our trip on mornings. Hold that thought! We still have some missing documents, we completed it because the requirements were accessible at that time. 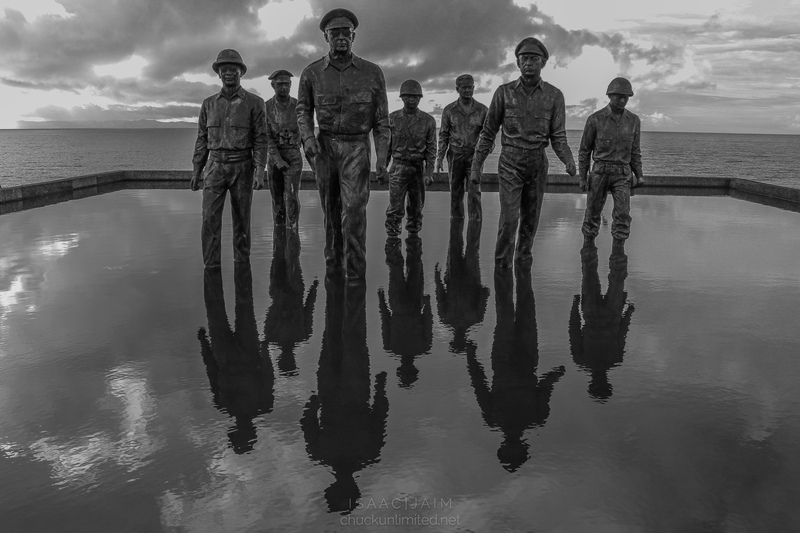 We visited the longest bridge which is the Marcos bridge, that is connected between Tacloban and Leyte, and then we visited the park of Douglas Macarthur. The park is famous but it is not a populated area, I had an opportunity to take this photo, which it was terrific because of its reflection by the water. You can even turn it upside down, the water is not that clear. I decided to make this photo black and white it is because I wanted to share the old memorable heroic stories 50 years ago to make it feel that the photo looks like an old photograph. I tried a few photos of it because my camera was still new at this time. I also had a newbie experience on taking some shots, so I manually set up the camera into 1/500 for the shutter speed so we may still see the skies in the background. To prevent noise images, I manually play the ISO settings to 200-400, at this time I still dont know which one was better. It was a kit lens, so a lens was never a pressure for me. Now the real pressure is from the Adobe Lightroom. Firt off is the exposure, I scaled it down so we still see more dynamic range of the photo, minimized the highlights so we may see the skies more better. The shadows are scaled to high so we are able to see th statues and their faces. I did not have to bother the sharpness, but for basics I edited the clarity for clearer edges of the photo.